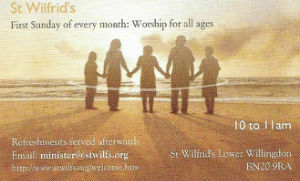 Worship services for the first Sunday of each month start at 10.00 am as usual. However, this one has a slightly different flavour. We aim to keep these services to just under an hour, with a shorter sermon than normal which will explore some of the Bible passages (usually from the Gospels) which a generation that has largely missed 'Sunday School' can engage with. There is usually a spot aimed at children, and at least one song is suitable for young ones to bang on our percussion instruments. Although this is a 'Morning Prayer' worship service, we take a more informal approach over all, and it's an ideal service for your first visit if you're worried about not knowing what to do. Why not pop along and join us one Sunday?